By @SimonCocking, great Fintech event in Kerry, we find out more. 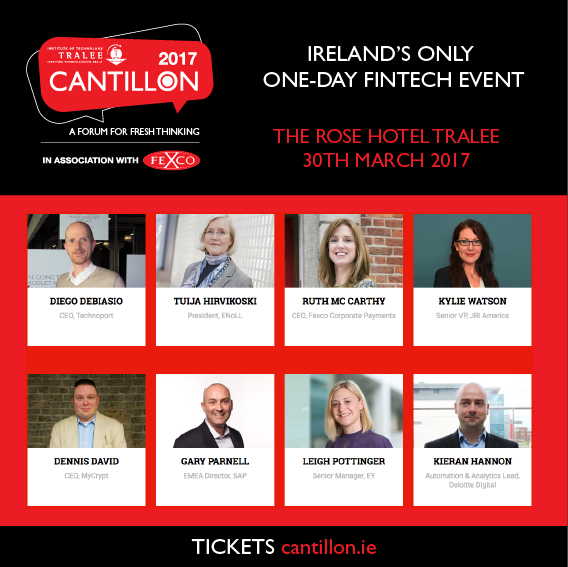 Cantillon 2017 is on Thursday 30th March at The Rose Hotel in Tralee. economists, journalists, academics and entrepreneurs to discuss key topics – this year ‘fintech’ – and how new technologies are impacting on business, policies and global sectoral trends. opportunities for Irish companies, both start up and established, in the area of financial technology as well furthering the discussion around attracting the necessary talent to support this growing sector. blockchain technologies and associated sectors like Cyber Security. Research speakers by reviewing the schedule at cantillon.ie. At the event – network and make the most of breaks and lunch. Ask questions – panel discussions will be open to a Q&A. Tickets can be booked via www.cantillon.ie. The conference is run in association with FEXCO.